NEW BRITAIN - Xandra Silva battled a lingering illness, a barrage of cold rain and anxious nerves in her first varsity start for the New Britain softball team, but the freshman, or “Shorty” as her teammates call her, delivered and continued the Hurricanes’ strong start to the season. 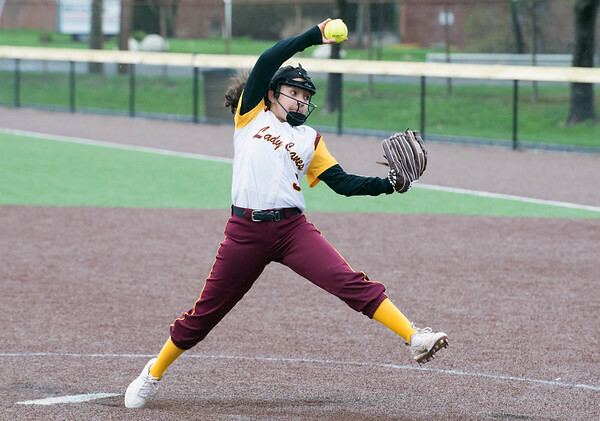 Silva, appearing in the circle for the first time in her high school career, threw five innings and allowed two runs on just two hits in a rain-shortened 13-2 New Britain win over Hartford Public. It was a great game for Silva and many of the Hurricanes’ hitters, including Nataly Hernandez, who clubbed a three-run inside-the-park home run in the top of the fifth to give New Britain (4-1) a commanding 12-1 lead after the Hurricanes pushed across six runs in the first inning. “The conditions weren’t great, but we did what we had to do,” New Britain head coach Joel Simmone said. The Hurricanes’ monstrous first inning came at the express of a shaky Owls (0-3) defense, which matched the sloppy weather outside by committing five errors. Silva reached on an error to start the inning and scored on a triple to deep right field off the bat of Josleen Rivera, who later scored on a wild pitch before Amanda Jacobs drew a walk and later scored on an RBI groundout by Liana Silva, giving New Britain a 3-0 lead. Val Hernandez followed with a single and scored on a dropped fly ball off the bat of Paola Hernandez, who scored on an RBI single in the shortstop hole by Naieska Perez. When the Hurricanes were finally retired, the Owls had suffered a wild pitch and two passed balls on top of their five errors to help give Xandra Silva plenty of immediate run support in her first varsity start. Xandra Silva labored through a rocky start of her own, misplaying a ground ball off the bat of Angelica Jiminian to put a runner on first with one out. Jiminian stole second and advanced to third when the throw glanced off the glove of Makaila Masterson at second, putting Silva in early trouble. After a big strikeout for the second out, a low pitch from Silva bounced to the backstop allowing Jiminian to score and put Hartford Public on the board. It wasn’t the ideal beginning for Silva, but the freshman settled down to shut the Owls out over the next three innings while New Britain built an insurmountable lead. “My teammates were helping me out a lot, and I had a great catcher behind the plate to help me push through it,” Xandra Silva said. Liana Silva, meanwhile, helped Xandra navigate through the next three scoreless innings with a little help from Hartford Public. While the Owls had temporarily addressed their porous defense, they ran themselves out of a rally in the bottom of the second. Allison Salvin drew a leadoff walk and advanced to second on a stolen base, moving into scoring position for Tamisha Sanchez, who drew a walk of her own. When ball four bounced to the backstop, Salvin darted for third. When the throw to third sailed over the head of Jacobs, Salvin took off for home but tripped and fell halfway down the baseline. She was caught and tagged out in a rundown, and Sanchez was caught stealing two pitches later as the Hartford Public rally self-destructed, helping Xandra Silva settle down on the rubber. New Britain extended its lead in the fourth on a leadoff walk to Xandra Silva and a ripped single to right by Rivera, which turned into two runs for the Hurricanes when the ball slipped under the right fielder’s glove and rolled near the right field wall, allowing Rivera to complete her trip around the bases with ease and put New Britain ahead 9-1. One inning later, it was Hernandez making a trip around the bases when she smashed her three-run laser into the left-center field alley to give the Hurricanes’ a double-digit run total against the Owls for the eighth time in a row. Hartford Public added a run in the fifth as a light rain drastically picked up, making control of the strike zone next to impossible, especially for a pitcher’s first-ever varsity start. Still, she finished with six strikeouts and her first career win. “She battled through it and got the win, and that’s all that matters.” Simmone said. Posted in New Britain Herald, New Britain on Monday, 15 April 2019 20:36. Updated: Monday, 15 April 2019 20:39.